I’ve heard that one of the best ways to improve my Google search ranking is to fix anything that’s marked as incorrect in Google’s Webmaster Tools service. Problem is, when I did go to Webmaster Central it says my site’s not verified. How do I verify my Web site with Google Tools? 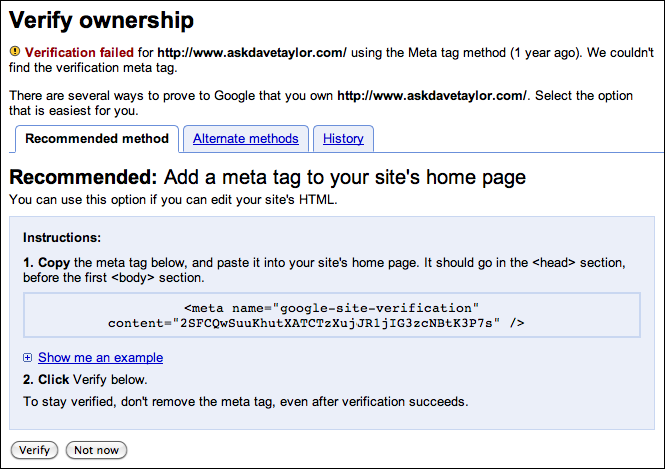 You’re spot on to be concerned with the information that Google Webmaster Tools reveals as not perfect with your site: it’s not the same team as Google’s search algorithm team, but they’re looking at a lot of the same factors, so if it doesn’t work for them, it’s quite possibly an issue with the search results, as you suspect. Then again, Google search is also a grand mystery and it’s possible that what Google Webmaster Tools reports is irrelevant. But… just in case that’s not the case… it’s probably a smart idea to be aware of what’s being reported. Once you verify you are the owner of your Web site. Let’s start at the beginning, though. At Google Webmaster Tools. Link to your Google Analytics account? That sounds easy, especially since I’m running Google Analytics on my site already. To try that, I just click on the radio button adjacent to “Link to your Google Analytics Account” and click on the “Verify” button. That’s right, there’s no “success” or “verified” message. If it works, you just see the Webmaster Tools data, information that’s only available to site owners. Now the hard part, reading what’s there and acting upon it. Good luck!